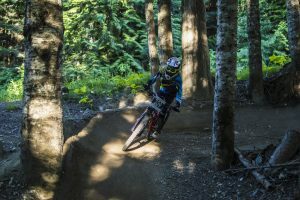 If you’ve been to a bike park or one of your local mountains at any point in the past few years, you’ve no doubt noticed that there are a lot more kids riding these days, and riding fast. First, you’re getting older; get over it. And second, you’re not crazy – there really are a lot more kids out on the trails. Congratulations, you’ve done it. You survived the early years of parenthood without quitting mountain biking, something that not all new parents can say. And you’ve been able to share your love of the sport with your little grom, and maybe even taken them to a bike park for what was probably an epic experience for them. Your grom’s enthusiasm is high, and you want to foster their curiosity for new things while steering them away from the dangers of drugs, goth culture, and road bikes. Instead of these horrors, I suggest you consider taking your grom to their first downhill race. There are grom races pretty much anywhere there are adult races, only less frequently. 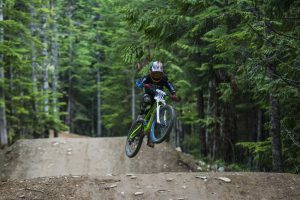 The races that Crankworx puts on as a part of their ‘Kidsworx’ side festival are great, but there are sure to be local options if you can’t make it to Whistler, Les Gets, or New Zealand. 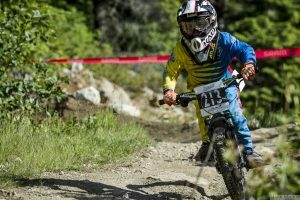 Below are some pointers on how to make your grom’s first DH race awesome for them. Before any mention of a downhill race is mentioned, your little grom has to feel confident that they can complete the course. Unlike their adult counterparts, the courses for grom races are normally announced in advance, so take advantage and let your racer test out the track and practice beforehand so they feel confident and ready when race day comes. 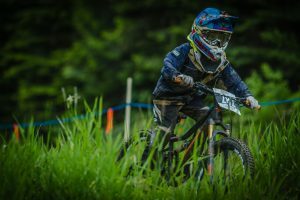 If your grom isn’t glued to the RedBull live feed every other weekend watching Atherton and Gwin try to out-amaze everyone on the World Cup circuit, then downhill racing may be a hard sell to start. Rather than focusing on the idea that victory and glory are only three or four minutes away, tell them about how they’ll get a race plate, how the course will be closed just for them, and that there will be prizes and maybe even a t-shirt! What sells kids on the competition is the experience and the fun, not the result, so play up the community aspect of it all and that they’ll be racing with a bunch of other kids who love mountain biking as much as they do. Somewhere between first making plans and the start gate, there’s almost certainly going to be a point where your grom tells you they’ve changed their mind and don’t really feel like racing anymore. Don’t worry; this is totally natural. Unlike team sports where there is a social pressure to show up for the good of the team, downhill racing is very easy to bail on. When this happens, have a chat about why they don’t want to race. It’ll probably be either because they’re worried they won’t win, or that they “just don’t feel like it”. You can remind them that it’s not about winning, but having a good time and that they’ll have to try it first to know if they love racing or not. Note: even after the first race, pre-race jitters can often take the form of a desire to bail on races entirely. This gets easier to counteract once you can remind the little racer how much fun they had at previous events. Your kid is no doubt awesome, and if they’re good enough to race downhill on a mountain bike trail at any speed, then they’re better than 80% of all adults just to start with. That said, there are some pretty fast little groms out there, and some of them are going to be the competition. Try not to set any expectations for the first race beyond trying hard. Once the first race is out of the way, you’ll have a sense of exactly how your grom stacks up against their contemporaries. If you’re riding the track already, then you’ve already got a bike to handle the course. You’ll want to make sure that everything is in perfect working order before the race, and be sure to pay special attention to the brakes. Your pint-sized racer is going to be traveling at speeds at or above their comfort level, so the ability to slow down quickly is going to be more useful than normal. If you’re running disc brakes, a relatively cheap upgrade you might consider is to throw a larger disc on their front wheel. Small bikes all come with small discs, so upgrading that will drastically increase the braking potential for little fingers, and you probably have a few discs laying around anyway. Good protective gear is essential. Virtually all races make full-face helmets, arm and leg protection mandatory at the younger ages. I STRONGLY recommend body armour and gloves, as the likelihood of a fall will be higher than normal. A neck brace wouldn’t hurt, either. After all, this is your kid’s safety we’re talking about. Things you can do without include backpack, water bottles, handlebar bells, etc. Some kids are used to always riding with a Camelback, so if that makes them more confident then let them ride with it, although I don’t recommend stopping mid-race to re-hydrate. Goggles will help as well, not just as eye protection, but to help the groms feel like big-time racers. I’ve known more than a few groms who’ve taken to wearing goggles when they started ‘getting serious’ about their downhill ‘career.’ Whatever floats their boat! There are generally two types of grom races; those that are held in conjunction with a larger adult race, and those that are their own standalone or series. In either case, the course is generally held on a beginner or easier intermediate run. As mentioned above, you’re going to want to be as comfortable with the course as possible, and a few runs should suffice if it’s not logistically possible to spend days practicing it. Just like any other race, it’s highly recommended to ride the course at least once after it’s been taped. This will give your grom an idea of what to expect, what lines won’t be available, and give them a little more comfort/confidence. So this is it, the day of the race. The culmination of all the practicing and preparation – the pressure is on! Scratch that; remember that this is going to be an exciting day for everyone and it’s the race that counts, not the result. This isn’t advice from some ‘everybody’s-a-winner-and-deserves-a-trophy-for-participation’ parent. Remember that all but a few of the racers aren’t going to win, unlike team sports where 50% of competitors emerge victorious. And unlike most team sports, there’s not going to be another game a week or less away. Downhill racing is about seeing how you compare to others, and then seeing if you can build on that. Plate pickup will either happen before the race or even the day prior. When you’re picking it up, confirm the starting format as well. Most races at this level don’t have a starting list with specific start times, but it’s best to confirm. On the more practical side, if you’ve got a checklist of what gear to bring out on a ride, be sure to use it, or make one if you don’t have it. Helmet, gloves, shoes, armour… Double and triple check that you’ve got it all. And don’t forget about yourself! Depending on the age category, there’s a good chance that you’re going to be racing down the hill behind your grom. This means that you’ll also have to have your own gear together. You’re going to want to play Boy Scout on race day and be prepared. Even if you don’t normally, take a kit to fix or replace a tube, a bottle or Camelback of water, and anything else you might need while waiting at the start gate. Mechanical issues and flats have a weird way of happening just before a race run, so bring along a multi-tool as well. Get there extra early. You’ve raised your grom to this point, so you know how little things always make you late, now compound that with race-day nerves and gear issues, and you’ll be happy for that extra time buffer. How the race is started. In most cases, racers are counted down a 5-second window and can leave anytime within it, but some will have a more traditional ‘on-you-mark-get-set-go’ start. What gear to start in. Remind them of any issues they have on the trail, like slowing down for a particular rock face or corner. How much fun it’s going to be. You also might want to look ahead and behind you and make a bit of a judgement call on how fast the riders look and if you think they’ll catch up to you. If you think they might make the gap, let them go ahead of you. Likewise, if you think your grom might catch up to the rider in front, feel free to ask the starter for a longer gap ahead of you. While you’re on course, trailing your pint-sized racer, your job is to be their personal cheer department. Feel free to yell encouragements and reminders of what’s coming up if needed. This may be a few of the most intense minutes of their short lives up to that point, so be positive and encouraging. If a rider does catch up to you while you’re on course, make sure that your little racer understands that they need to pull out of the way as soon as possible and let the rider pass. Conversely, if you catch up to someone, make your presence known so they have enough time to pull over safely. Aside from a few encouragements, reminders, and general safety, your work is pretty much done, so just sit back and enjoy the ride. There aren’t many other sports that you can actually experience with your grom at a competitive level. Congratulations, you both (presumably) survived! 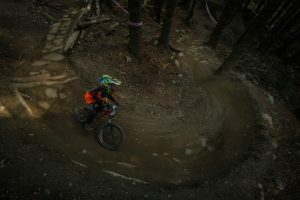 There are few sports that combine thrills and focus with pure cardio like downhill racing. Shortly after catching their breath, there’s going to be a window where the exhaustion fades and the endorphins start to kick in. Seize that opportunity to ask if your racer enjoyed the race. The answer will probably be ‘yes’, so grab on to that and help them cement the positive memories associated with what they just did and it’s magnitude. After all, not many kids can say that they’ve raced a bike down a mountainside. There’s often a time gap between the end of the race and the awards, so you might want to have an activity prepared ahead of time. Meet the family or other racers for a bite to eat, head up for a few extra laps, a dip in the lake, whatever, just be sure you’re back for the awards. Once it’s all over, it’s time to bask in the glory of the day. It could be on the long ride home or over the dinner table, but your grom will no doubt be talking about certain parts of the course, lines they took, and thoughts they have on the race for a few days. Just in time to start making plans for the next race!